Merry Christmas little blog! It's been a while with all the inevitable busyness, but now the school holiday is here and I have a little festive project to share. 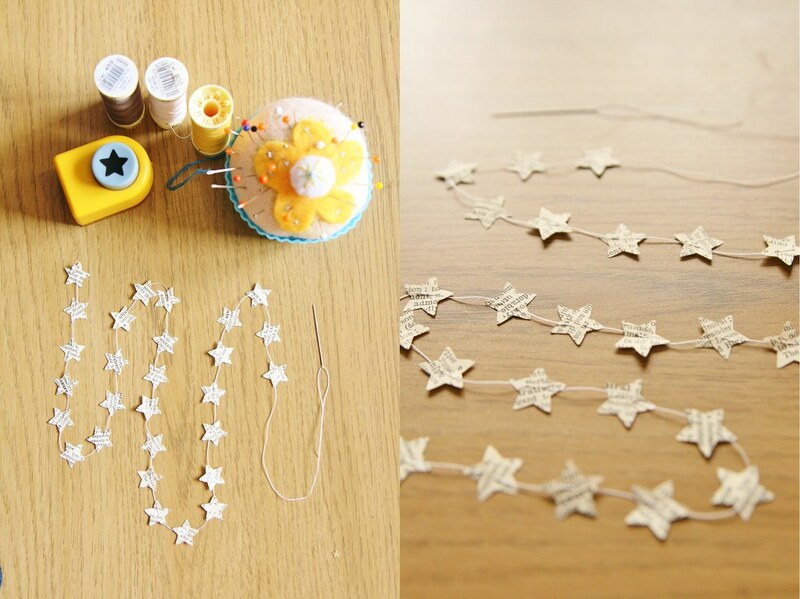 To make this simple string of stars, you need some patterned paper, a needle and thread, and a punch. Any shape will suffice, but I thought stars were Christmassy. Perhaps I can pass this off as a whole new idea in February with little hearts for Valentines day! I chose dictionary paper for my garland because it's very thin and the text pattern goes with everything, making the final project very versatile. 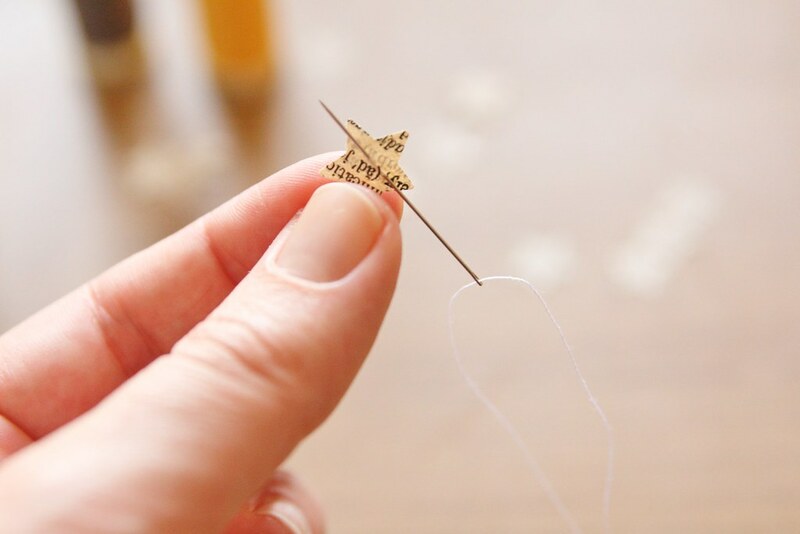 With a sharp needle, put a small stitch through each star and slide the paper down along the thread. A knot in the end will hold the first star in place, but I found once I'd slid each punched shape into position, they stayed put and didn't slip out of place or all fall to the end of the string. Using very delicate paper was also an advantage here as the needle could stitch straight through it and I didn't need to poke holes in advance. 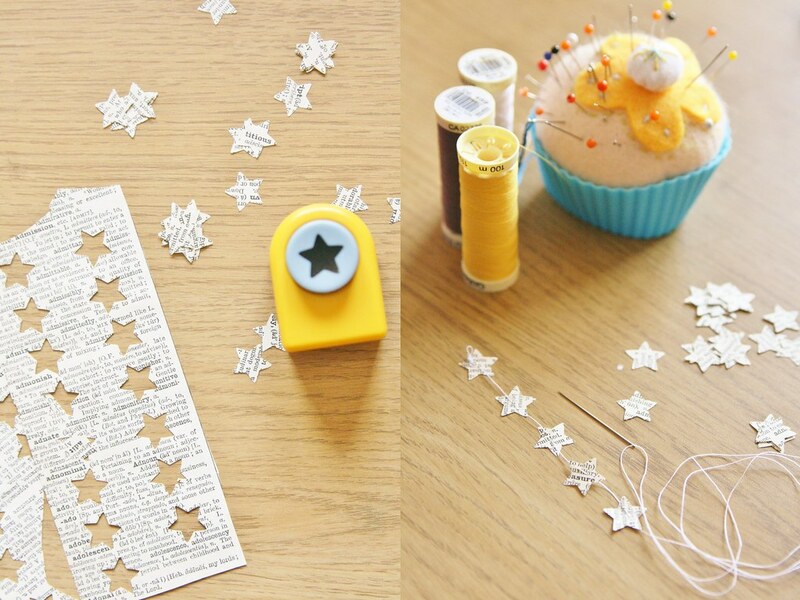 Once you've stitched through the desired number of stars, this little garland is ready to go! You can choose whichever spacing works for you; all together point to point, or spaced at intervals. These strung stars could go on presents, around a tree, drape along a shelf or, my personal favourite, go on a scrapbook page! I have a project to share using a string of stars in a day or two. Love the garland - I've just been watching Kirsty's Crafty Christmas on tv and she did something similar on string tied to helium balloons. I straight away took photos as a reminder, and now you have added to the idea. Thank you! So simple but fun. Look forward to what else you come up with for them.